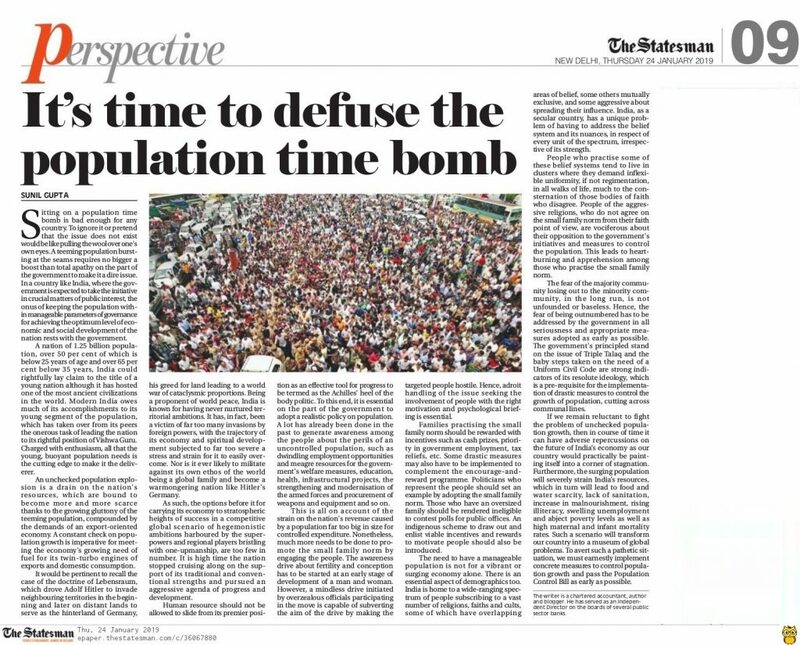 Sitting on a population time bomb is bad enough for any country. To ignore it or pretend that the issue does not exist would be like pulling the wool over one’s own eyes. A teeming population bursting at the seams requires no bigger a boost than total apathy on the part of the government to make it a dire issue. In a country like India, where the government is expected to take the initiative in crucial matters of public interest, the onus of keeping the population within the manageable parameters of governance for achieving the optimum level of economic and social development of the nation rests with the government. A nation of 1.25 billion population, over 50% of which is below 25 years of age and over 65% below 35 years, India could rightfully lay claim to the title of a young nation although it has hosted one of the most ancient civilizations in the world. Modern India owes much of its accomplishments to its young segment of the population, which has taken over from its peers the onerous task of leading the nation to its rightful position of Vishwa Guru. Charged with enthusiasm, all that the young, buoyant population needs is the cutting edge to make it the deliverer. An unchecked population explosion is a drain on the nation’s resources, which are bound to become more and more scarce thanks to the growing gluttony of the teeming population, compounded by the demands of an export-oriented economy. A constant check on the population growth is imperative for meeting the economy’s growing need of fuel for its twin-turbo engines of exports and domestic consumption. It would be pertinent to recall the case of the doctrine of Lebensraum, which drove Adolf Hitler to invade neighbouring territories in the beginning and later on distant lands to serve as the hinterland of Germany, his greed for land leading to a world war of cataclysmic proportions. Being a proponent of world peace, India is known for having never nurtured territorial ambitions. It has, in fact, been a victim of far too many invasions by foreign powers, with the trajectory of its economy and spiritual development subjected to far too severe a stress and strain for it to easily overcome. Nor is it ever likely to militate against its own ethos of the world being a global family and become a warmongering nation like Hitler’s Germany. As such, the options before it for carrying its economy to stratospheric heights of success in a competitive global scenario of hegemonistic ambitions harboured by the superpowers and regional players bristling with one-upmanship, are too few in number. It is high time the nation stopped cruising along on the support of its traditional and conventional strengths and pursued an aggressive agenda of progress and development. Human resource should not be allowed to slide from its premier position as an effective tool for progress to be termed as the Achilles heel of the body politic. To this end, it is essential on the part of the government to adopt a realistic policy on population. A lot has already been done in the past to generate awareness among the people about the perils of an uncontrolled population, such as dwindling employment opportunities and meagre resources for the government’s welfare measures, education, health, infrastructural projects, the strengthening and modernisation of the armed forces and procurement of weapons and equipment and so on. This is all on account of the strain on the nation’s revenue caused by a population far too big in size for a controlled expenditure. Nonetheless, much more needs to be done to promote the small family norm by engaging the people. The awareness drive about fertility and conception has to be started at an early stage of development of a man and woman. However, a mindless drive initiated by overzealous officials participating in the move is capable of subverting the aim of the drive by making the targeted people hostile. Hence, adroit handling of the issue with the involvement of people with the right motivation and psychological briefing is essential. Families practising the small family norm should be rewarded with incentives such as cash prizes, priority in government employment, tax reliefs, etc. Some drastic measures may also have to be implemented to complement the encourage-and-reward program. Politicians who represent the people should set an example by adopting the small family norm. Those who have an oversized family should be rendered ineligible to contest polls for public offices. An indigenous scheme to draw out and enlist viable incentives and rewards to motivate people should also be introduced. The need to have a manageable population is not for a vibrant or surging economy alone. There is an essential aspect of demographics too. India is home to a wide-ranging spectrum of people subscribing to a vast number of religions, faiths and cults, some of which have overlapping areas of belief, some others mutually exclusive, and some aggressive about spreading their influence. India, as a secular country, has a unique problem of having to address the belief system and its nuances, in respect of every unit of the spectrum, irrespective of its strength. People who practise some of these belief systems tend to live in clusters where they demand inflexible uniformity, if not regimentation, in all walks of life, much to the consternation of those bodies of faith who disagree. People of the aggressive religions, who do not agree on the small family norm from their faith point of view, are vociferous about their opposition to the government’s initiatives and measures to control the population. This leads to heart burning and apprehension among those who practise the small family norm. The fear of the majority community losing out to the minority community, in the long run, is not unfounded or baseless. Hence, the fear of being outnumbered has to be addressed by the government in all seriousness and appropriate measures adopted as early as possible. The government’s principled stand on the issue of Triple Talaq and the baby steps taken on the need of a Uniform Civil Code are strong indicators of its resolute ideology, which is a pre-requisite for the implementation of drastic measures to control the growth of population, cutting across communal lines. If we remain reluctant to fight the problem of unchecked population growth, then in the course of time it can have adverse repercussions on the future of India’s economy as our country would practically be painting itself to a corner of stagnation. Furthermore, the surging population will severely strain India’s resources, which in turn will lead to food and water scarcity, lack of sanitation, increase in malnourishment, rising illiteracy, swelling unemployment and abject poverty levels as well as high maternal and infant mortality rates. Such a scenario will transform our country into a museum of global problems. To avert such a pathetic situation, we must earnestly implement concrete measures to control population growth and pass the Population Control Bill as early as possible. The divide between urban and rural India has to be studied when deliberating on the issue of population growth. Urban families have adopted one or two child lifestyle however rural families still lack this. India is about to surpass China in terms of number of people but the land available with us is far less. Where will we accommodate so many people? Apartments and high rises are all risky. BJP leaders and RSS people have been persuading Hindus to bear more children. Then how can one expect population bomb to diffuse? This is what we can term as hypocrisy of the ruling government. When China adopted one child policy they were under serious threat of unmanageable population explosion. Look how astutely they managed the situation, we must also take cue from them. Everyone knows that land and natural resources including soil are limited. Hence people relying on them should also be proportionate otherwise shortage of land and water and other resources will be experienced. Population control measures in India are much-needed if want to preserve country’s peace. With more and more people sustaining on few available resources, there can be threats to internal peace. There isnt much the policymakers have to do. You can directly take the China one-child policy and implement it as it is in India and you can have amazing results. If there has to be a strict small family norm, then it should be universal and no religion or tribe must be spared. The idea of reducing state benefits to large families is wise and can trigger checks and controls. Indian families have a tendency to produce more offsprings so that they can take care of the elderly people. This can change if government can introduce some reforms for senior citizens. Ofcourse we face terrible outcomes of unchecked growth of population. We are a poor country and can never become comprehensively developed if we do not restrict the number of kids a family produces. Hello there. I could have sworn I have been to your blog before but after browsing through a few of the posts I realized its new to me. Regardless, I am certainly happy I stumbled upon it and I will be book-marking it and checking back regularly.